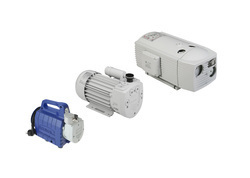 Manufacturer of a wide range of products which include vacuum pumps. Schmalz offers a range of Oil-lubricated pumps, dry-running pumps and water-ring pumps for high vacuum values with a low volume flow. Dry running pumps are robust and require little maintenance. The current consumption is low with an economical continuous operation. Ideal for airtight work pieces. Water ring pumps are suitable for continuous operation at high outputs without additional overload protection. These are robust & maintenance-free design for the highest demands with respect to the surrounding air and the ambient temperature, such as in the foodstuffs industry.